runnsta Gård you will find in the village of Brunnsta, a cosy old village that still carries the remembrance of the past. In and around the village there are plenty of historic leftings such as burial grounds, rune stones and rock carvings. 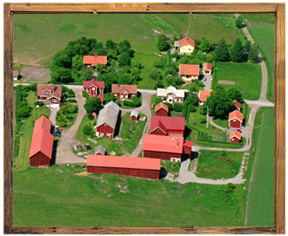 The houses are typical Swedish painted red and white and you will find Brunnsta almost as in the world of the author Astrid Lindgren. At Brunnsta Gård tranquillity and exciting adventure go hand in hand. At our farm you can stay in an apartment, a room or in a small cottage. We also have facilities to arrange conferences or parties. One of our specialities is study tours in Sweden, but also in Europe, especially Italy. We speak Swedish, English, German, Italian and some French.